I have flowers all over my home, adorning my desk at work and I have even worn them in my hair as an accessory, especially when I wear an afro. Of course, I love the look of fresh flowers, but I love looking at flowers, period. I love artificial flowers, floral scents, flower petals, flower paintings and drawings… if it is connected or related to a flower, I am in love! So you can just imagine my excitement for the floral trend. I have been wearing floral prints since I was a child (all little girls had at least one floral little dress, lol). I am excited to see this as a trend as it has been part of my closet for years.. If you don’t own any floral prints, go get it today! Or if you have a dress buried in the closet with flowers on it, pull it out! 😉 If you have no floral prints at all, begin at a thrift store. This dress and blazer was thrifted at two different times, but they were the perfect match. I also love the look of floral prints paired with stripes. I love your whole look & the shoes 😍! 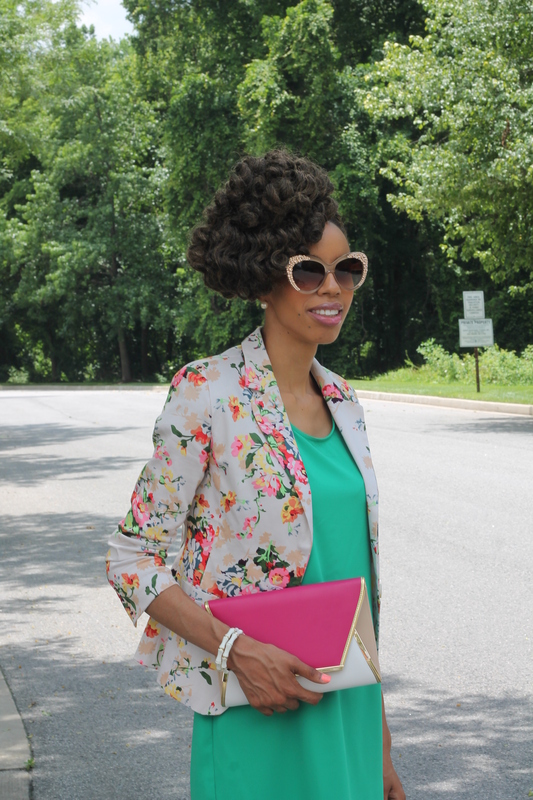 This entry was posted on June 30, 2015 by LaQuisha Hall in All Dressed Up, Dresses, OOTD, Shoe Spotlight, Thriftanista and tagged fashion, ShoeDazzle, style, summer.